U njemu je jako zgodan “Acitivity Monitor” koji daje pregled toga ko šta radi nad odabranom bazom. Ali treba znati šta koja kolona znači, i šta znači ono što piše u njoj. Session ID – A unique number that is assigned to each user connection when the connection is made. User Process – Displays 0 for a system process and 1 for a user process. By default, the filter setting for this column is 1. This displays only user processes. Login – The SQL Server login name under which the session is currently executing. Database – The name of the database that is included in the connection properties of processes that are currently running. Task State – The state of the task. Background-The SPID is running a background task, such as deadlock detection. Sleeping-The SPID is not currently executing. This usually indicates that the SPID is awaiting a command from the application. Running-The SPID is currently running on a scheduler. Runnable-The SPID is in the runnable queue of a scheduler and waiting to get scheduler time. Sos_scheduler_yield-The SPID was running, but it has voluntarily yielded its time slice on the scheduler to allow another SPID to acquire scheduler time. Suspended-The SPID is waiting for an event, such as a lock or a latch. Rollback-The SPID is in rollback of a transaction. Defwakeup-Indicates that the SPID is waiting for a resource that is in the process of being freed. The waitresource field should indicate the resource in question. Command – The kind of command that is being processed under the task. Application – The name of the application program that created the connection. Wait Time (ms) – The time, in milliseconds, in which this task is waiting for a resource. When the task is not waiting, the wait time is 0. Wait Type – The name of the last or current wait type. Wait Resource – The name of the resource that is needed. Blocked By – If there are blocking sessions, the ID of the session that is blocking the task. Head Blocker – If there are blocking sessions, identifies the session that causes the first blocking condition. A value of 1 represents a head blocker for other sessions. Memory Use (KB) – The amount of memory, in kilobytes, that is being used by the task. 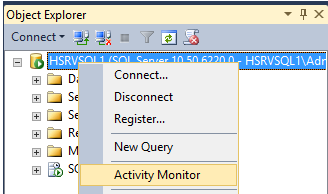 Host Name – The name of the computer that made the connection to the instance of SQL Server. Workload Group – The name of the Resource Governor workload group for the session.